Check out the bodule of the that nodule, A.K.A. LDUCZ-V1653 Cheirolepis trailli. This is the most fishy looking fossil we’ve had on underwhelming fossil fish of the month for quite some time. According to the label for this specimen, this is an example of Cheirolepis trailli, the first non-ghost Cheirolepis fossil to appear in this series. Cheirolepis is an extinct genus of freshwater ray-finned fish that lived in Devonian period. 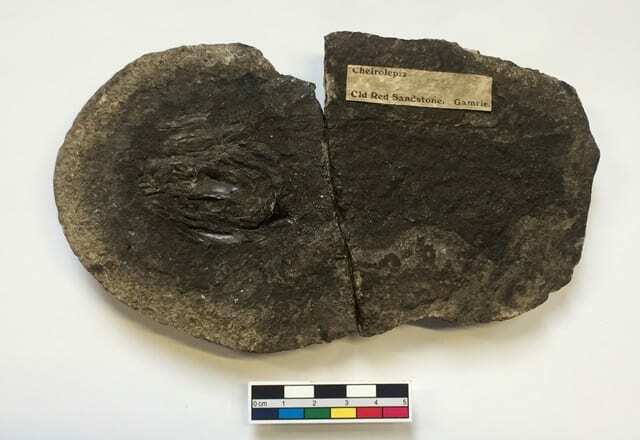 Cheirolepis trailli was the first species of Cheirolepis to be named and was described from fossils from Scotland, which is where this specimen is reportedly from. Cheirolepis is thought to have been an active predator that relied on sight to hunt. Preservation From the looks of it, this specimen has been preserved inside a nice elliptical nodule which has been split in half to show us this lovely fish and then this half seems to have also been split in two too. This specimen hasn’t been preserved in a huge amount of detail: the rough shape of the fish can kinda be discerned if you squint, from a distance and have a bit of imagination. On the left hand side are what I presume to be the slightly discombobulated bones of the head although I’d be hard pressed to be able to pick out a single identifiable element to try to work out which way up this fish should be. It’s a times like these that a palaeo-artistic reconstruction by an up-and-coming-everybody-is-talking-about-them-deceptively-young-looking-palaeo-artist might come in really handy…. No? Oh. That usually works. Err okay then, Scientific Research JOY UPON JOYS, the database entry for this fossil suggests that it has been figured a number of times which I hoped may be an actual first for underwhelming fossil fish of the month. According to the database this specimen is “References Figd. 1925 Proc. zool. Soc. Moy Thomas p.107, Romer p 48,50,55 Traite de Pal. 43”. Which is actually three different references. I think. Alas, after hunting down some of these, this note merely indicates that Cheirolepis trailli is figured in general, not this specific specimen. Which although disappointing, makes sense because, well you look at the fossil. I’m not sure what there is to figure. Our old friend D.M.S Watson, wrote about Cheirolepis trailli an number of times but sadly this specimen which was in his collection seems to have been less useful than specimens in the British Museum (Natural History) and in Manchester. In putting together some of the text figures, he does mention that reconstructions were made from specimens at other museums and “in my own possession” which doesn’t entirely rule out this specimen (Watson 1925). If we’re really clutching at straws. In general, Cheirolepis has been of scientific interest as an early actinopterygian (the most diverse group of vertebrates, the ‘ray-finned’ fish) genus, however, more often than not these fossils leave scientists scratching their heads when it comes to questions of evolution of cranial dermal bone and enamel. Cheirolepis is one of the earliest fossil fish known to possess the standard arrangement of bones in the cranium, which is seen in all ray-finned fish today, so give a nod to Cheirolepis the next time you see a trout head. In Society I think this is a first for Underwhelming Fossil Fish of the Month, this fossil actually has had some impact on wider society. 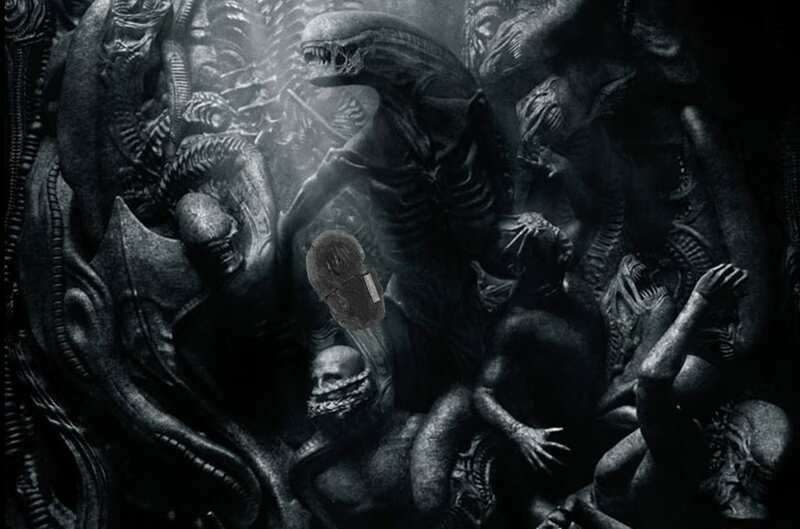 The more eagle-eyederer of you out there will have spotted this fossil in the recent poster advertisements for Alien Covenant. Cheirolepis trailli was allegedly spotted by a talent scout who was on the hunt for colourless amorphous looking shapes for the striking advert and I think you’ll agree, Cheirolepis trailli really fits the bill and ‘makes’ the aesthetic of the marketing campaign. Watson, D.M.S. 1925. The Structure of Certain Palaeoniscids and the Relationships of the Group with other Bony Fish. Proceedings of the Zoological Society of London. LIV. 815-870. I actually never noticed it until you so gracefully pointed out – Cheirolepis must … MUST – have been the original inspiration for H.R. Giger’s extraordinary design of the alien in the aptly named original film ALIEN (1979). I would suggest that the powers-that-be seek legal recompense regarding use of these specimens in promotional material dating back to 1979, which would amount to a nice bit of moolah. On the other hand, I wouldn’t want to upset Ridley Scott, who is a genius. Perhaps you could offer other underwhelming fish as inspiration for future blockbusters? TOP GUN 2, mayhap? Nice fossil though. Positively cute. I see it was allegedly discovered at Gamrie, along the road from our museum at Banff. We have one or two from there in our own large collection of fossils which may or may not be fish. They are not as delightfully oval and nodule-y as this one, sadly. However, I’m REALLY missing the palaeo-artistic reconstruction by an up-and-coming-everybody-is-talking-about-them-deceptively-young-looking-palaeo-artist though. Sigh. As ever, thanks Helen. Your fervent enthusiasm and perpetual disappointment is the fuel that keeps this series going. Incidentally, the reviews of Alien Covenant indicate that it too is underwhelming further confirming the link between underwhelming fossil fish and the Alien franchise.